Gout-Gone is a safe, non-addictive, natural remedy containing 100% homeopathic ingredients especially selected to temporarily relieve symptoms of gout, such as swelling and redness in small joints, especially the big toe. Gout-Gone helps to support joint health and keep uric acid levels in the healthy range, thereby temporarily addressing discomfort associated with gout, without the risk of side effects. Gout-Gone is also a great complementary remedy to InflammaGo™, which temporarily relieves minor aches and pain in muscles and joints. 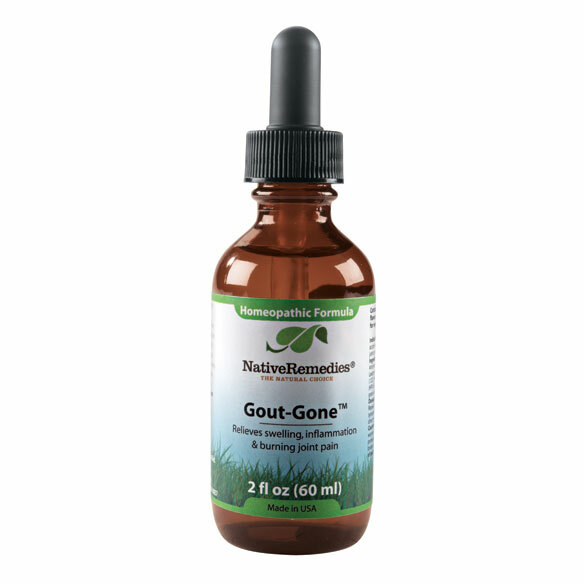 Gout-Gone is taken internally and presented in a convenient, concentrated tincture formula. It is easy to ingest and hassle-free with no artificial colors or preservatives. Due to its unique homeopathic formulation, it is safe for all ages. USA. 2 fl. oz. Gout-Gone is 100% homeopathic, contains these ingredients, and has the following indications (purposes): Antimon crud 6C HPUS, Benzoicum ac 6C HPUS, Ledum 6C HPUS, Nux vom 6C HPUS, Quercus 12C HPUS, Rhododendron 6C HPUS, Silica 6X HPUS. Antimonium crud 6C HPUS: gout with gastric symptoms, pain in the fingers, feet very tender with large horny bones, pain in heels. Quercus 12C HPUS: useful in gout. Rhododendron 6C HPUS: rheumatic and gouty symptoms, joints swollen, gouty inflammation of great toe joint, gout which is aggravated by stormy weather. Benzoic ac 6C HPUS: joints crack on motion, rheumatic gout, gouty deposits, manifestations of gout, rheumatic or of other kinds. Silicea 6X HPUS: predominant role in connective tissue. Nux vom 6C HPUS: cracking of knee joints during motion, purgatives, overuse of spirits, coffee, tobacco. Ledum 6C HPUS: gouty pains shoot all through the foot and limb and in the joints, especially small joints, gouty nodosities, gouty swelling of the big toe. Hold bottle upside down and drop directly into the mouth. Alternatively, dilute drops in a small amount of water and sip slowly. First Dose: Take 0.50 mL every 20-30 minutes as needed until symptoms subside. Daily: Take 0.25 mL 3-5 times daily. Gout-Gone is a homeopathic remedy and is safe for all ages. There are no known drug interactions. Thought you carried "NopaVera " Natural Pain & inflammation relief? 2 oz Bottle has picture of a cactus on front.